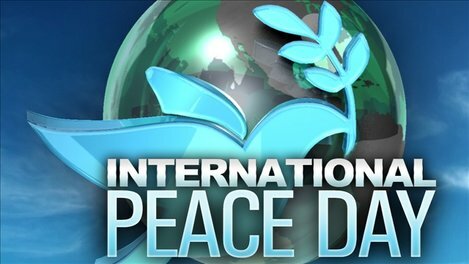 Today is International Peace Day! It is a day that allows us a connected space to pray for International Peace, to practice personal Peace and to give thanks for the energy of peace. Contrary to the many pronouncements of the media, Peace prevails. Pockets of war and strife garner all the headlines while ongoing personal and national peace initiatives and victories create an energy that sustains our fragile planet. I pray daily for world Peace and for those who are caught in the jaws of conflict and personal danger, Join me. I practice sending peaceful energy to all that I meet, Join me. I offer prayers of thanks for the energy of Peace in every living thing on earth, Join me. I also read Good News from http://www.goodnewsnetwork,org while others reach for the dominating media. This space has the mission of connecting as many people as possible in peaceful thought and conversation at the same time every day. Words and feelings are our most powerful tools. Will you make the commitment to join others in circling the world with thoughts, word and actions of Peace? I am grateful for you. I wish for you the loving serenity of Peace. Please share this article with your friends. I am a Peace lover. I dare to believe that a critical mass of peace lovers can create a phase transition causing a shift in world consciousness toward living in peace. We can all feel the undercurrent of the desire for peace on earth. It CAN happen. Join this movement. Share the posts. I am grateful for you! This entry was posted in Uncategorized and tagged collective focus, god, huffington post peace, human-rights, Individual Responsibility, International Peace Day, love, Peace, Peace Initiative, power of words, Sharing Love, Sharing Peace, spiritual vibrations, spirituality, War. Human-rights, World Peace. Bookmark the permalink.